Description As described by the Roman historian Livy (1st century BCE), the youthful Massiva was the nephew of Masinissa, king of Numidia in present-day Algeria who had supported Carthage against the romans commanded by Scipio Africanus (a Roman general so known because of his conquests in North Africa). Massiva was captured by the Romans on the battlefied in North Africa in 209 BCE and brought before Scipio. When Scipio learned the youth's identity, he chastized him for not obeying his uncle and staying off the battlefield. Scipio could had had him sold as a slave but instead he sent the youth back to his uncle for punishment but laden with gifts. The Numidian king and general was so impressed by this act of clemency and the moral code behind it that he went over to the side of the Romans and helped turn the tide of history. 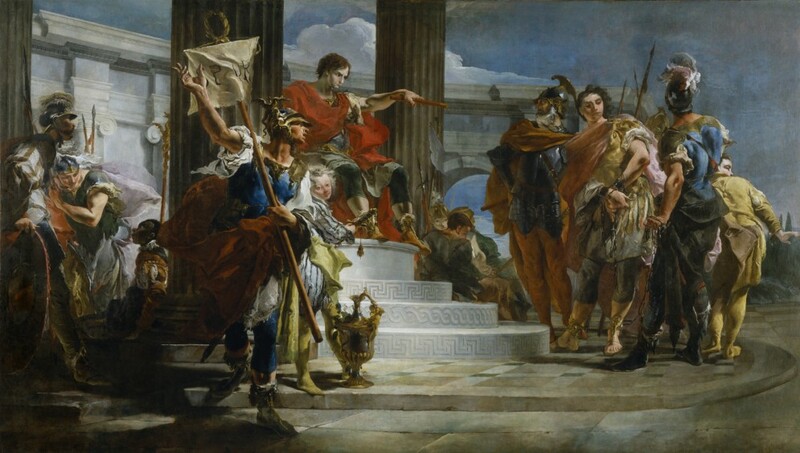 Tiepolo, the greatest Italian history painter of the 18th century, combines dramatic gestures, grand scale, and classical architecture to tell his story of generosity and statesmanship. Details such as the banner with the initials of the Roman state situate the story in Roman history. Under the artistic conventions of the time, North Africans of high status, including Numidians, were generally depicted with European features. The black youth chatting with the soldiers on the left is probably Scipio's servant. It is very likely that the painting was commissioned by the Corner family, among the richest of the Venetian nobility. The family traced its anestry back to Scipio and other members of the Cornelia line among the Roman elite. they were engaged in large-scale renovations at just about this same time. Tiepolo Unveiled: The Restoration of a Masterpiece. The Walters Art Gallery, Baltimore. 1996. Giambattista Tiepolo 1696-1996. The Metropolitan Museum of Art, New York. 1997. Provenance Don Marcello Massarenti Collection, Rome [date and mode of acquisition unknown] [1897 catalogue: no. 404]; Henry Walters, Baltimore, 1902, by purchase; Walters Art Museum, 1931, by bequest.